[Update (April 3, 2018) : 1) The whole thing has collapsed in a heap. In May, a Queensland-based businessman named Daniel Spiller has organised a series of events titled ‘Conservative Forum 2018’, which promises to ‘take you on a journey with music, entertainment and inspirational speakers’. 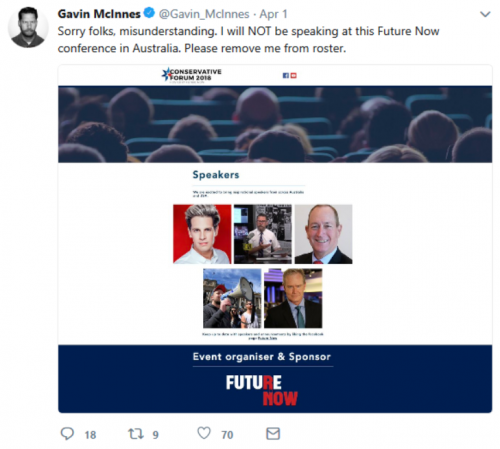 Scheduled to take place in Brisbane (May 4), Sydney (May 10), Melbourne (May 19) and Perth (May 25), the list of speakers is rather short: ex-One Nation Party turned independent Tory MP Fraser Anning, ex-Tory MP and Sky News blabbermouth Ross Cameron, Milo Yiannopoulos (via a livefeed) and er, convicted racist and stalker Neil Erikson. 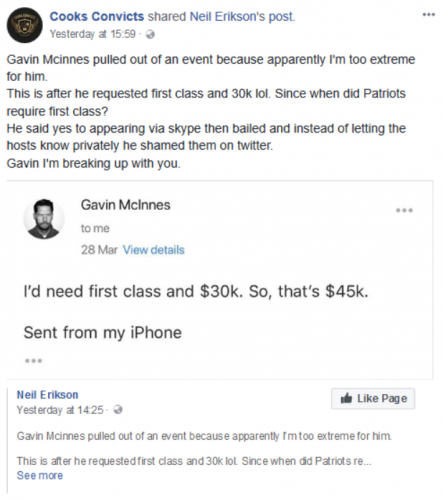 Otherwise, Daniel and the Conservative Forum (organised under the auspices of some thing called ‘Future Now’) embrace all the usual tropes: Africans, Islam, Multiculturalism and Political Correctness are Bad; Colonialism is Good; Feminism is Cancer; Homosexuality is Pathological; ‘Steve Irwin Predicted Apex’. Daniel also came into bat for Neil when TOLL took him to court. 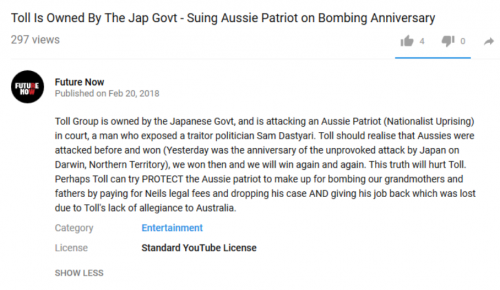 This entry was posted in !nataS, Anti-fascism, State / Politics and tagged ATM Industrial Panel Tanks, atm tanks group, Australian Tank Maintenance, Conservative Forum 2018, Daniel Spiller, Fraser Anning, Future Now, Future Now Australia, Gavin McInnes, Industrial Panel Tanks Pty Ltd, Jet Ski Hire Gold Coast, Milo Yiannopoulos, Neil Erikson, Pacific Tank Maintenance, Proud Boys, Ross Cameron, Steve Irwin Predicted Apex, TOLL, Toll Group, www.atmtanks.com.au, www.conservativeforum.com.au, www.future-now.com.au, www.panel-tanks.com.au. Bookmark the permalink. Also amusing is the ‘unprovoked attack’ on Darwin. Whilst technically correct, Australia DID make sure Japan wasn’t allowed a place in the League of Nations coz yellow people, derr.